Roku is changing TV. Enjoy great movies and TV shows from Netflix and Amazon Video On Demand and live games from Major League Baseball. You’re in control of what you watch, how you watch and when you watch. From the Wall Street Journal to WIRED, everyone’s raving about the Roku player. 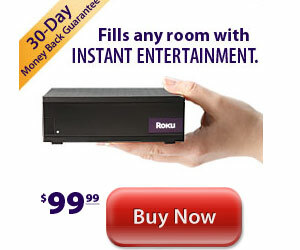 Priced at just $99.99, the affordable Roku player is compact, easy to set up and intuitive to use. Netflix members can now easily access over 12,000 movies and TV shows – including hundreds in HD – instantly from Netflix over the internet. Netflix members can watch as much as they want and as often as they want without paying more or impacting the number of DVDs they receive.